Castor canadensis (beaver) is native to North America, and has been introduced to Tierra del Fuego in southern South America, Finland, France, Poland and Russia in recent times. 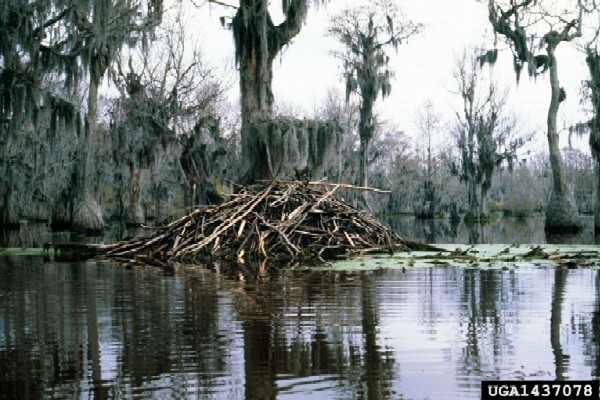 In its introduced range, the damming activity of the beaver can cause flooding which can damage forests. They also have the ability to quickly cut down large numbers of trees. In Finland, they compete with native beaver populations. In their native range, they cause flooding on major highways by plugging highway culverts. Castor canadensis (beaver) is a large hervbivorous rodent typically found near water. Adults may be up to 1200mm long and weigh between 18-47kg. Colour ranges from yellowish-brown to black with reddish-brown most common. Guard hairs are long and coarse and the under fur is dense and lead grey in colour. The tail is broad, scaly and dorsoventrally flattened. It is black in young animals but becomes lighter with age. Adaptations for aquatic life include nictitating membranes on the eyes, valvular ears and nose, lips closing behind incisors and webbed hind feet (Jenkins and Busher, 1979; Nummi, 2006). Castor canadensis (beavers) can swim up to 8 km an hour. They secrete waterproofiing oil from glands at the base of their tail. The offspring are born fully furred and eyes wide open. They can swim within 24 hours and after several days they are also able to dive out of the lodge without any accompaniment. They leave the dam at two years of age (Anderson, 2002). Castor canadensis (beavers) are trapped and used primarily for their pelt (Langan, 1991). Beavers are being reintroduced to areas where they have been made extinct to improve wetland ecosystems. Castor canadensis (beavers) are always found close to water and they require forest to provide food and building material (Nummi, 2006). Beavers have a unique ability to cut trees and this allows them to build mud and wood lodges in which they live, nest and store food. Lodges may be completely surrounded by water or built on the banks of ponds, lakes or streams.They are also able to build watertight dams which create ponds behind them where the beavers are then able to build lodges (Jenkins and Busher, 1979). This behaviour alters large areas of habitat and is the reason why beavers are termed “ecosystem engineers” (Nummi, 2006). Castor canadensis are monogamous. They usually become sexually mature during their second winter at the age of 1.5 years, although it can be delayed until 2.5 years or later (Nummi, 2006). Beavers mate once a year during winter. Gestation lasts about 105 days and the sole litter is born in spring. Litter size is usually between three and four, but can vary from one to nine (Jenkins and Busher 1979; Hill 1982 in Nummi, 2006). Kits weigh about 500g at birth. Castor canadensis (beavers) are \"choosy generalist\" herbivores. They eat leaves, twigs and bark of most species of woody plants growing near water and also herbaceous plants, particularly aquatics. Whilst they have a wide ranging diet they show a large preference for certain plant species such as aspen (Populus spp.) and willow (Sailx spp.). Roots and rhizomes of water lilies are a particularly important source of winter food (Jenkins and Busher, 1979). Castor canadensis (beaver) was introduced to Finland as part of a programme to reintroduce the European beaver (C. fiber). (Nummi, 2006). They were introduced to Poland and farmed (Nummi, 2006)Castor canadensis (beaver) was introduced to southern South American during an Argentine government program to establish furbearers in Tierra del Fuego.Castor canadensis (beaver) was introduced to Finland as part of a programme to reintroduce the European beaver (C. fiber). (Nummi, 2006). Principal source: Christopher Anderson and Brett Maley, Institute of Ecology, University of Georgia, Athens GA 30605 and Omora Foundation, Puerto Williams, XII Region, Chile. Nummi, P. 2006. NOBANIS – Invasive Alien Species Fact Sheet – Castor canadensis. Recommended citation: Global Invasive Species Database (2019) Species profile: Castor canadensis. Downloaded from http://www.iucngisd.org/gisd/species.php?sc=981 on 21-04-2019. Castor canadensis (beavers) are known as \"ecosystem engineers\" for their ability to alter the physical and chemical nature of water bodies and their adjacent terrestrial systems in both their native and introduced range (Nummi, 2006). Two recent studies have investigated the impacts of beavers on ecosystems in their introduced range in southern South America. Beavers have been found to cause significant reduction in forest cover up to 30m from water effectively removing riparian forest. In their introduced range of South America Beavers modify the original ecosystem from closed Nothofagus forest to a grass- and sedge-dominated meadow. Nothofagus forest and seedlings are suppressed by beavers but herbaceous plants have been shown to increase in number and diversity. Unfortunately most of the increase in herbaceous plant diversity is due to invasion of the areas by non-native species (Anderson et al. 2006). Deforestation caused by C. canadensis also has the immediate effect of increased erosion due to exposed slopes (Lizzaralde et al, 2004). Forests may not completely regenerate in meadows for more than 20 years after removal of beavers due to flooding and sediments completely covering the forest floor which impedes seedling germination and establishment (Martinez Pastur et al, 2006). Anderson and Rosemand (2006) investigated the effect of beavers on the aquatic ecosystem and found that ponds created by beavers had increased productivity but at the expense of significantly reduced macroinvertebrate diversity. Via physical, chemical and geomorphological alterations, beavers modify the structure and function of entire biotic communities and ecosystems. Lizarralde et al (2004) found that beaver colonized sites in the Tierra del Fuego Archipelago, Argentina had submerged vegetation and algae indicative of high nitrogen concentrations. Wood debris from fallen trees causes an accumulation of organic material that modifies the biochemical composition of waters, sediments, soils and adjacent riparian areas. These alterations make beaver-altered sites more suitable for introduced fish species (Salmo trusttafario, Salvelinus fontinalis and Onchorrychus mybis) and sustained invertebrate communities typidcal of slow-water habitats (Lizzaralde et al, 2004). Beavers dam the river in which their lodge occurs, and sometimes the dam breaks causing extensive flooding. Dams act as barriers to migration in the stream and also form areas of impounded water behind them, increasing water temperature (Alexander, 1998). Beavers are also known for their ability to rapidly clear a forested area, and also cause flooding to roads by plugging highway culverts (Jensen et al. 2001). Most Castor canadensis (beaver) management is through various forms of trapping for pelts. Demand for pelts has decreased so now there is little incentive for trappers to hunt beavers. Beaver colonies have been moved to other areas but in most cases other beavers move into the area and replace the beavers that were removed. 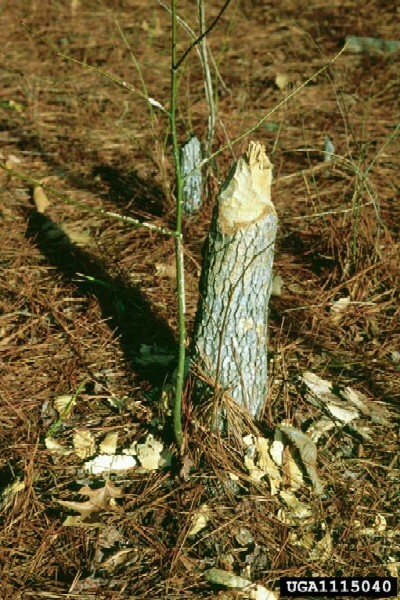 Similar problems occur with trapping – removing the resident population simply allows other beavers to replace them. Dams in Canada have been blown up but it is a costly process and frequently new dams are created in the same place. 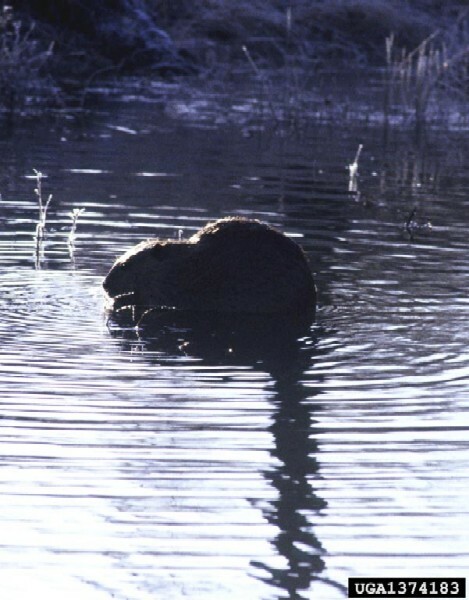 Jensen et al (2001) suggest installing oversized culverts as a way of discouraging beaver plugging activity. McKinstry and Anderson (1998) state that Hancock and Bailey traps are typically used for live trapping beavers, but are bulky and expensive, and suggest steel cable snares as an alternative. Informations on Castor canadensis has been recorded for the following locations. Click on the name for additional informations. Di Paola, M.E. and Kravetz, D.G. 1999. Invasive Alien Species: Legal and Institutional Framework in Argentina. Workshop on the legal and institutional dimensions of invasive alien species. IUCN. Summary: This article outlines the legal framework for invasive alien species in Argentina. Edmonton. 1995. A plague of compulsive dam builders: 1994 was a bumper year in Alberta for bothersome beavers. Western Report. 9: 22-23. Summary: A report of the effects of Castor canadensis in it s native ranges. Jensen, P.G., Curtis, P.D., Lehnert, M.E., and Hamelin, D.L. 2001. Habitat and structural factors influencing beaver interference with highway culverts. Wildlife Society Bulletin. 29 (2): 654-664. Summary: This article discusses the factors involved in beaver damage to highway culverts, and methods to reduce this damage. McKinstry, M.C., and Anderson, S.H. 1998. Using snares to live-capture beaver, Castor canadensis. Canadian Field-Naturalist. 112 (3): 469-473. Summary: This article outlines the various methods used for live-trapping of beavers in Wyoming. Skewes, O., Gonz�lez, F., Rubilar, L. and Quezada, M. 1999. Investigaci�n, aprovechamiento y control castor, islas Tierra del Fuego y Navarino. Instituto Forestal-Universidad de Concepci�n, Punta Arenas. Alexander, M.D. 1998. Effects of beaver (Castor canadensis) impoundments on stream temperature and fish community species composition and growth in selected tributaries of Miramichi River, New Brunswick. Canadian Technical Report of Fisheries and Aquatic Sciences. 0 (2227): 1-44. Summary: This report gives details about the impacts of the beavers damming activity in its native range. Anderson, C.B. 2004. Exotic vertebrate fauna in Cape Horn County, Chile. Report � BIOKONCHIL Biodiversity Assessment Project. UFZ-Halle Environmental Research Center. Leipzig, Germany. 37 pp. Summary: This gives information on exotic vertebrate species in Cape Horn County, Chile. Anderson, C.B., Rozzi, R., McGehee, S.M., Torres-Mura, J.C. and Rosemond, A.D. (in review). Exotic Vertebrate Fauna in the Remote and Pristine Sub-Antarctic Cape Horn Archipelago Region of Chile. Biodiversity and Conservation. Summary: This article gives information on the exotic vertebrate species in the Cape Horn Archipelago region of Chile. Anderson, R. 2002. Castor canadensis , Animal Diversity Web. Summary: This web page gives a wide variety of information on both Castor canadensis and Castor fiber. It also has a wide variety of links and resources for more information. Bailey, J.K., Schweitzer, J.A., Rehill, B.J., Lindroth, R.L., Martinsen, G.D., and Whitham, T.G. 2004. Beavers as molecular geneticists: A genetic basis to the foraging of an ecosystem engineer. Ecology. 85 (3): 603-608. Summary: A report on the molecular genetics of C. canadensis. Bailey, P. 1997. Beaver upcreek: research links Yoho National Park s buck-toothed rodents to biological diversity. Beautiful British Columbia. 39: 37. Summary: A man s description of his visit to Yoho National Park. Beavers: Wetland and Wildlife. 2002. BWW INC.
Summary: A web site with information on Castor canadensis. Summary: This article gives information on the introduced mammals of the Patagonia region of Argentina. Briones, M., Schlatter, R., Wolodarsky, A. and Venegas C. 2001. Clasificaci�n ambiental para h�bitat de Castor canadensis (Kuhl 1820, Rodentia), de acuerdo a caracter�sticas de cuencas en un sector de Tierra del Fuego. Anales del Instituto de la Patagonia, Serie de Ciencias Naturales. 29: 75-93. Coronato, A., Escobar, J., Mallea, C., Roig, C.,and Lizarralde, M. 2003. Geomorphological characteristics of mountain watershed rivers colonized by Castor canadensis in Tierra del Fuego, Argentina. Ecologia Austral. 13 (1): 15-26. Summary: This article discusses the habitat preferences of the North American beaver in Tierra del Fuego, Argentina. Harkonen, S. 1999. Forest damage caused by the Canadian beaver (Castor canadensis) in South Savo Finland. Silva Fennica. 33 (4): 247-259. Summary: This article gives details about the impacts of the North American beaver in Finland. Jaksic, F.M., Agustin Iriarte, J., Jiminez, J.E., and Martinez, D.R. 2002. Invaders without frontiers: cross border invasions of exotic mammals. Biological Invasions. 4: 157-173. Summary: A report on the effects of Castor canadensis as an invasive species in Argentina and Chile. Jenkins, S.H. and Busher, P.E. 1979. Castor canadensis. Mammalian Species 120: 1-8. Summary: A report of the effects of Castor canadensis in Canada. Lesica, P. and Miles, S. 2004. Beavers indirectly enhance the growth of Russian olive and tamarisk along eastern Montana rivers. Western North American Naturalist. 64 (1): 93-100. Summary: This article discusses the effects beavers have on ecosystems and the role they play in the invasion of exotic plant species such as Russian olive and tamarisk in North America. Lizarralde, M., Escobar, J. & Guillermo. 2004. Invasder species in Argentina: a review about the beaver (Castor canadensis) population situation on Tierra del Fuego ecosystem. Interciencia 29(7): 352-356. Summary: Impacts of beavers in Argentina. Lizarralde, M.S. 1993. Current status of the introduced beaver (Castor canadensis) population in Tierra del Fuego, Argentina. Ambio. 22: 351-358. Summary: This article gives information about the status of the North American beaver in Tierra del Fuego. Lizarralde, M.S. and Venegas, C. 2001. El castor: un ingeniero ex�tico en las tierras m�s australes del planeta. In: R. Primack, R. Rozzi, P. Feinsinger, R. Dirzo and F. Massardo. Fundamentos de Conservaci�n Biol�gica: Perspectivas Latinoamericanas. pp. 231-232. Fondo de Cultura Econ�mica, Ciudad de M�xico. Lizarralde, M.S., Bailliet, G., Poljak, S., Fasanella, M. & Giulivi, C. 2008. Assessing genetic variation and population structure of invasive North American beaver (Castor canadensis Kuhl, 1820) in Tierra Del Fuego (Argentina). Biological Invasions 10: 673-683. Summary: This study analyses the genetic diversity of invasive populations of beavers in Tierra Del Fuego (Argentina). Lizarralde, M.S., Deferrari, G., Alvarez, S.E. and Escobar, J. 1996. Effects of beaver (Castor canadensis) on the nutrient dynamics of the Southern Beech forest of Tierra del Fuego. Ecologia Austral. 6: 101-105. Summary: This article gives information about the impacts beavers are having on the southern beech forests of Tierra del Fuego. Lizarralde, M.S., Deferrari, G., Escobar, J. and �lvarez, S. 1996. Estado de la poblaci�n de Castor canadensis introducida en Tierra del Fuego y su estudio cromos�mico. PID-BID 50/92, Direcci�n General de Recursos Naturales de la Provincia de Tierra del Fuego, Ant�rtida e Islas del Atl�ntico Sur, Ushuaia, Argentina. Martinez Pastur, G., Lencinas, M.V., Escovar, J., Quiroga, P., Malmierca, L. & Lizarralde, M. 2006. Understorey succession in Nothofagus forests in Tierra del Fuego (Argentina) affected by Castor canadensis. Applied Vegetation Science 9: 143-154. Summary: Effects of C. canadensis on Nothofagus forest understorey in Argentina. Massoia, E. and Chebez, J.C. 1993. Mam�feros silvestres del Archipi�lago Fueguino. L.O.L.A., Buenos Aires. 261 pp. Mellink, E. and Luevano, J. 1998. Status of beavers (Castor canadensis) in Valle de Mexicali, Mexico. Bulletin Southern California Academy of Sciences. 97 (3): 115-120. Summary: This article gives details about the distribution of beavers in Mexico. Monroe, B. 1998. State Mascot and Pest. The Oregonian. A17. 17 June. Summary: A newspaper article about the impacts of Castor canadensis in Oregon. Nummi, P. 2000. Canadian Beaver (Castor canadensis). Department of Applied Biology, University of Helsinki. Summary: A detailed report of the effects of Castor canadensis as an invasive species in Finland. Nummi, P. 2006: NOBANIS � Invasive Alien Species Fact Sheet � Castor canadensis. � From: Online Database of the North European and Baltic Network on Invasive Alien Species � NOBANIS www.nobanis.org. Summary: General fact sheet about C. canadensis detailing ecology, distribution and impacts. Ray, A.M.; Rebertus, A.J. ; Ray, H.L. 2001. Macrophyte succession in Minnesota beaver ponds. Canadian Journal of Botany. 79: 487-499. Summary: A report suggesting Castor canadensis is a keystone species. Rinaldi, C., and Cole, T.M. 2004. Environmental seasonality and incremental growth rates of beavers (Castor canadensis) incisors: implications for palaeobiology. Palaeogeography-Palaeoclimatology-Palaeoecology. 206: 289-301. Summary: An indepth study on the ecological and physiological effects on logitudinal growth rates of teeth. Rosell, Frank, Boszer, Orsolya, Collen, Peter & Parker, Howard., 2005. Ecological impact of beavers Castor fiber and Castor canadensis and their ability to modify ecosystems. Mammal Review 35 (3-4), 248-276. Sielfeld, W. and Venegas, C. 1980. Poblamiento e impacto ambiental de Castor canadensis Kuhl, en Isla Navarino, Chile. Anales del Instituto de la Patagonia. 11: 247-257. Summary: This article gives information about the impacts of the North American beaver on Navarino Island, Chile. Streubel, D. 2000. Castor canadensis (American Beaver). Main area of expertise is the impacts of Castor canadensis on the Archipelago of Tierra del Fuego (Argentina and Chile). Department of forest ecology, P.O.Box 27. FIN-00014. University of Helsinki.